Hot on the heels of last week’s public meeting, Leeds City Council’s leaders are about to begin their debate on whether Leeds should bid to become European Capital of Culture in 2023. The council’s executive board (made up of senior councillors) is going to discuss the issue at a meeting next week (22nd January). It’s early days. The only thing they’ll be deciding is that a detailed report is brought back to them early next year (2015) after discussions have taken place city-wide. That report will include a detailed look at the “funding implications” of a possible bid: putting together a bid will cost, as will paying for a dedicated project team to manage and deliver the bid. “The Council has already been approached by a private sector organisation interested in financially supporting this work and by another public sector organisation offering additional resource. These conversations are on-going,” says a report drafted for next week’s meeting. The public discussions over the next 9-12 months will include the use of an online forum and the Citizens’ Panel. The 42,000 young people who have the local Breeze leisure card will be approached for their views, and council staff will offer help to community and cultural organisations who want to find out more. “If the city is to bid it would need to make its intentions known by 2016, and will need to have the support of a wide range of stakeholders, not just the cultural sector,” says the report. The report that the council leaders are going to discuss on the 22nd is unusual and worth a read. For a start, it’s the first time (that I’m aware of) that an analysis of social media has formed part of a report going to the executive: there’s data and commentary presented on the impact on Twitter of last week’s Town Hall meeting about a possible bid, with individual tweets quoted. And the tone and content of the report aren’t your usual council officer’s report fare either. “A major consideration is the question of how would achieving this award make any difference to those living in poverty in the city? How could bidding for the title make a difference to a 10 year old living in poverty now who will be an adult in 2023, or to a young woman of 20 not in education, employment or training now and who will be 30 in 2023? “Bringing the city together to bid is almost as important as winning, as it offers an opportunity to address issues within the culture and arts sector and bring the city, not just its cultural institutes, together under a shared ambition. We have our own huge strengths of course but, outside of the city, Leeds itself does not really have an identifiable cultural profile outside of retail. It is notable that hardly any of our major arts institutions have a titular Leeds identity. Think of Opera North, Northern Ballet, West Yorkshire Playhouse, Yorkshire Dance, Northern School of Contemporary Dance. Currently, is Leeds much less than the sum of its remarkable parts? What would it cost financially and in terms of commitment from the sector to address these issues in the lead up to the bid submission? Could it be done in time? See what you think. The full report is here. 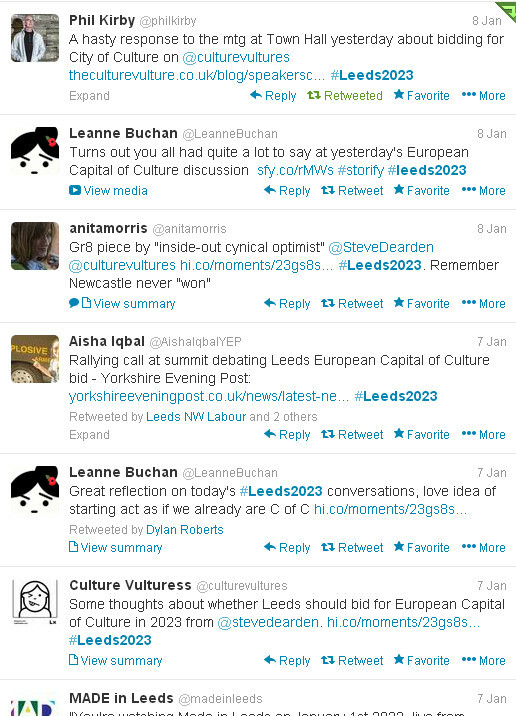 This entry was posted in Uncategorized and tagged european capital of culture, leeds, leeds city council, leeds2023. Bookmark the permalink. Hallelujah! Whoever wrote this report is showing signs of thinking differently. After a series of initiatives that have subsidised profit taking by the wealthy might we actually use something to address inequality? It’s a remarkable report, isn’t it? Never read one like it. A good start. Bidding to be ECC, never mind wining it, could certainly be beneficial to Leeds – aiding development and regeneration and improving people’s lives in all sorts of ways. But I think the council should avoid mixing the specifically cultural aspects of the bid with wider social and economic issues. What should matter most about being ECC is the quality of the culture that takes place. However, if the council believes that “we should perhaps not bid” if it does not “directly” “make a difference” to the lives of those for whom “our cultural riches do not always serve equally” or “to those living in poverty”, this implies that what matters most is its ability “serve” other non-cultural agendas – which is a recipe for producing ‘worthy’ crap in which ‘the message’ comes before the quality of what is produced. Culture can and does make a difference to people’s lives, but in all sorts of immeasurable and indeterminate ways. To say the least, culture is ill-suited to tackling poverty or any social problem; and at worst looking to culture avoids addressing them directly. As the report says, bidding for ECC should be a spur to jobs and business which “accelerate improvements to the public realm” – Good! But in terms of the events that Leeds puts on, the aim should be on originality and quality rather than extra-cultural agendas. Totally agree with you about “message” art, but i don’t think they’re talking about worthy culture being ‘done’ to/for poor people or in their name, are they? Are they? Aren’t they talking about the year 1) offering ALL of us opportunities to experience (and maybe join in with) the cultural stuff that’s dreamt up by someone else, and 2) including the sort of culture that can make a massive difference to ALL our lives, the stuff we make happen for ourselves among people we’ve got some sort of bond with. And if the Capital thing happens, it should offer ALL of us the opportunity to be enterprising and reap some of the more tangible benefits (cash, change in our lives) – if we fancy having a go. Not just the grant farmers, the investors, the agents of the state and their partners, the arts houses and their street facilitators and their ilk. Isn’t that they’re saying? Still. Maybe one of the authors will explain what they meant. Yes, they don’t talk about worthy culture being done for, or in the name of, the poor. But if such instrumental concerns aren’t at the back of their minds, why in a document about bidding for be a city of “culture”, would the council so strongly question that bid if it didn’t address extra-cultural concerns? That seems odd to me. For example, if you had a year of poverty I wouldn’t expect the council to say it wouldn’t be worth doing if it didn’t “make a difference” to the city’s culture – though it might inadvertently? So why make such non-cultural outcomes so crucial to bidding to be a city of culture? Surely, what matters most about bidding to be city of culture is its cultural offering? What they should say is that it’s not worth bidding if the first and foremost consideration isn’t producing original, exciting and quality cultural events and works. Any other spin-offs are an added bonus. But, as I’ve said, the effects of culture are immeasurable and indeterminate. You can’t engineer positive social or economic outcomes into the production of culture, without potentially damaging it. Neither can you have any “sort of culture [that] would make a massive difference to ALL our lives?” What exactly would that be? The Council will want – and need – as broad a spectrum of Leeds population involved in whatever way in the city of culture bid. And I see the Town Hall meeting as a first and genuine attempt to engage with those already involved in Leeds’ cultural scene as possible and encourage as many people as possible to think about how they could be involved. And we’d all want any benefits that come out of bidding for ECC – cultural, social, economic – spread as far and wide as possible. But this is a bid to be “city of culture”. So if Leeds held loads of great cultural events enjoyed by many, but it didn’t tick the social inclusion box, lift one person out of poverty, or address any other extra-cultural concerns, than that would still be a successful year of culture. What it would reflect badly on are social and economic policies designed to prepare for that event – which should exist anyway, but for which the bid should be an added spur. Are we a bit at cross-purposes? Most ECoC bids set themselves economic and social objectives as well as cultural ones. You may well be right. The people who wrote the report may well be thinking about social inclusion tick-boxes and poverty alleviation targets as part of the former when they talk about “making a difference”. But they haven’t said so yet. All they’re saying is that it will be a priority for them that any bid “makes a difference” (they don’t say how) to “people in poverty” as well as to everybody else. Until we hear otherwise, that means encouraging involvement and promoting opportunities to reap some of the cultural, social and economic benefits. I expressed myself badly about the DIY cultural stuff (with a misplaced ALL). I was thinking of the dance/clubbing scene (massive in Leeds), and in particular about its DIY (rave culture) roots. It’s an example of a cultural activity that people make happen for themselves among people they’ve got a bond with. And can make a massive difference to their lives. I realise that through being city of culture, city’s look to address other issues. But what concerns me is mixing up the purely cultural side of the bid with those other concerns. I am deliberately jumping the gun on this when it comes to the council based mainly on paragraph 4.4 – that it’s perhaps not worth bidding if it doesn’t address other concerns – and a few other sentences throughout the document. But my comments were also in reaction to your and Mike’s praise for this side of the document. Over the last two decades culture has been increasingly co-opted by government and state-backed third sector orgs to deliver all sorts of other non-cultural “outcomes” – to the detriment of culture and actually addressing those issues. Whenever any large cultural event is put on today, often the first thing on people’s minds – as it was with some I spoke to at the Town Hall – is how do we get x community involved, or address y issue, rather than what would be good to put on in it’s own terms as part of the city’s cultural offering. But as you say, they haven’t said yet how they’ll approach this. We will wait and see. Fair enough. I share some of your general unease about the dead hand of the well-intentioned state. What struck me about the report as much as the content was the tone, which felt human, enthusiastic and full of doubt, rather than the dry, didactic stuff that I end up reading every day.